How do the 3P’s help us obey God’s Holy Word? How should we approach our reading, studying, interpretation, and application of God’s Holy Word? PRECEPTS are specific and clear commands in the Bible, from God’s mouth or hand or through His prophets or messengers. Again, these are clear commands from God, to be obeyed by the followers of God. This needs to be qualified and clarified a bit before proceeding. During the various ages and stages of humanity, God gave various commands and “frameworks” or “covenants” that related to either individuals, tribes, nations, and/or all of humanity, as recorded in God’s Holy Word, the Bible. If one reads through the books of Genesis and Exodus, this becomes abundantly clear. God starts with a command to Adam and Eve. Next, we find a covenant with Noah and then covenants with Abraham, Isaac, and Jacob. Then, in Exodus, God seals a covenant that is loaded with commands through Moses to the descendants of Jacob, the nation of Israel. In each case, differing sets of commands, agreements, and relational obligations for each covenant with God exist. As an example, there are no commands, principles, or patterns that can be derived from the lives of Abraham, Isaac, and Jacob that indicate that they kept the Sabbath, ate only “clean” foods, gave a set of “tithes” on a regular, consistent, and on-going basis, or ever went to temple/tabernacle, etc. Those kinds of commands, principles, and patterns of behavior came later under the Mosaic Law or covenant given by God through Moses on Mount Sinai to the descendants of Jacob, the nation of Israel. Thus, the commands, or precepts, always relate to the covenant that is in force at the time. So, in our case, as follower-disciples of Jesus Christ, we are under the New Covenant, inaugurated in the blood of Christ. And, as Hebrews 7:12 states, “For when there is a change in the priesthood, there is necessarily a change in the law as well” (ESV). Although this might be confusing, God’s Word is very clear regarding what Jesus Christ’s disciples are to obey and to follow in His New Covenant. So, regarding the specific precepts we are supposed to obey within the New Covenant, in Jesus Christ, it is our obligation to follow and obey those, specifically, as we trust in our Savior in deep intimacy, with a heart full of gratitude. PRINCIPLES – A principle is a law or rule that has to be, or usually is to be, followed or can be desirably followed, or is an inevitable consequence of something, such as the laws observed in nature or the way that a system is constructed. The principles of such a system are understood by its users as the essential characteristics of the system, or reflecting the system’s designed purpose, and the effective operation or use of the system would be impossible if any one of the principles was to be ignored. 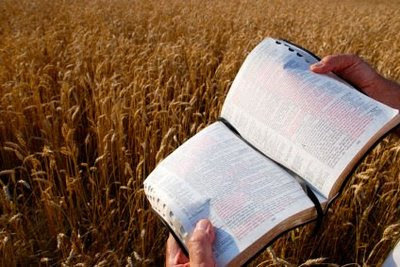 Principles within God’s Word are those kinds of concepts, ideas, and truths that are typically thematic, repetitive, and normative, that is, those overall teachings within God’s Word that are common themes and are seen repeatedly. These are thematic truths regarding concepts and/or ideas God wants us to understand and live by. In many cases, these Biblical principles that we discover in God’s Word help us to live for Christ in fruitful and effective ways that are pleasing to Him. One example of a Biblical principle regards Israel, herself. Specifically, God will not abandon her, but in the future, He will fully re-engage the whole nation as His holy people and involve them centrally in His Kingdom’s purposes. This is a well-established principle from Old Testament prophecies to New Testament doctrinal teachings, such as those found within the New Testament book of Romans, within chapters 9 through 11. In these passages, a principle can be seen and understood that although Israel has not fully accepted Jesus Christ as her Messiah, one day in the future she will. Israel will, eventually, no longer be the “tail” but the “head” of all the nations—one day in the future. These principles then lead to implications and applications. As stated in the previous sentences, these summaries of the “truth” are understandable principles. Although these principles do not specifically lead us to “obey” anything directly, they do lead us to some implications, such as the recognition and tenderness we should have toward God’s holy and chosen People, Israel. We are to respect God’s people and pray for them, etc. We are not to persecute them, nor seek to kill them, nor seek to discriminate against them. There are many other principles that are clearly written in the Holy Bible. Here is one: “By the witness of two or three a ‘fact’ is confirmed.” This principle is found in Deuteronomy 17:6 and 19:15, Numbers 35:30, Matthew 18:16, and 2 Corinthians 13:1. If you read the contexts of Deuteronomy 17:2-7 and 19:15-21, it should be clear that God wants us to make sure that knee-jerk reactions and emotions do not control any type of search for the truth. This applies to all areas in life, but especially in legal cases of criminal acts, such as murder. Thus, we see a principle clearly written by God and repeated within His Holy Word, along with “commentary” for clarification. There are “principles” like this throughout God’s Holy Word, the Bible, that God wants us to know and understand. In most cases, these principles still apply to us today. PATTERNS (or PRECEDENCE) – The focus with this topic or concept relates to patterns of attitudes, thinking, beliefs, practices (“religious practices” or “rites”), celebrations, behaviors, ways of doing things, etc. that stem from and flow out from the precepts and principles within the pages of the Holy Bible. These patterns can relate to God’s people in their responses and/or reactions of “living faith” in trusting and obeying God’s Word. What we want to do is find “patterns” in the Bible that help us better trust and obey Jesus Christ. Of course, this does not mean that everything we see the Early Church do in the Book of Acts, for example, is “prescribed” or “dictated” to us today, in that we must do things exactly as they did. However, we can study the Book of Acts and discover principles of “church life” that can help us in the church, today, to become more effective and fruitful in living for Christ. In the order of priority, patterns are last, and precepts are first. It makes sense to understand these concepts in this way. When we study and look at “patterns” in the Bible, we must first find out if God’s people are trusting in God and seeking to obey Him based solely upon the precepts and/or principles found in the Bible. Then, we seek to find out if God is pleased with and/or blessing those patterns. If this is so, then we can, most likely, try to see how those patterns can be something we should follow or do in our day and age. And, if that is so, then we would need to prayerfully seek to find out how to put those things into practice based upon God’s precepts and principles, in a way that is relevant and meaningful in today’s world, so that “it” conveys the original message and/or concepts that it did in Scripture. Let us look at an example. PRECEPT: “not forsaking our own assembling together, as is the habit of some, but encouraging one another, and all the more as you see the day drawing near” (Hebrews 10:25 [NASB]). The words used to convey assembling of yourselves relate to the Old Testament public, large-group “holy convocations” during certain feast days. They do not relate to any “in-home,” private, cozy gathering. I know that there are many who may not like that interpretation, but these are the facts regarding this passage. The apostle Paul, whom the early church believed wrote the book to the Hebrews, wrote this to Jewish-Israeli Hebrews, and so he is conveying this concept and/or principle based upon revealed Scripture. If one reads Hebrews 10:23-25, in context, it is clear that verse 23 relates directly to one’s own personal and private relationship with God. Verse 24 relates to an interactive, smaller group setting in a “one another” context, which reflected upon the “Sabbath” and “Passover” settings, which were in the home with a smaller grouping of people. Verse 25 relates to the larger, public group settings, as seen in Feast Day of Pentecost (Shavuot), Feast Day of Trumpets (Yom Teruah), Day of Atonement (Yom Kippur), and The Feast of Tabernacles (Sukkot). Those four celebrations had certain “holy convocations” or public, set-apart assemblies or gatherings during their respective “Feasts.” This is what verse 25 of Hebrews 10 relates to. It is both a command and a principle. It is a command in that it does not come across as optional. “Do not” is an imperative command, not a passive “maybe” when it is convenient or “if you want to.” So, in verses 23-25, we have a progression from a personal, private setting to a smaller “in-home” setting, and then finally to a larger, more public gathering or assembly. Do we see this “pattern” that “reflects” Hebrews 10:24-25 in the Book of Acts? To answer that question, we just need to see how God’s people organized themselves in the second chapter of Acts after Peter’s evangelistic call to salvation — Acts 2:42-47. We find that they met, assembled, and gathered together “from house to house” and met publicly in the temple almost every day. To see if this is a consistent “pattern” of meeting publicly and “in-homes” as a “both/and” pattern, a couple more passages seem to confirm this: Acts 5:42 and Acts 20:20. Thus, throughout most of the time that the book of Acts records the church’s growth and multiplication, the “pattern” of meeting publicly and “from house to house” seems to be very consistent and continuous. This would lead the student of the Bible to conclude that this “pattern” of faithful obedience to God’s precepts and principles regarding “gathering” patterns would be for each church family, or local church or local church families, to gather publicly (in some way) in some sort of larger, more public way and from house to house in smaller group gatherings. Of course, this is not a prescription that tells us as followers of Christ which specific days and times to meet, either. The Acts passages give us a pattern of how the Early Church lived out obedience to the precepts found in Hebrews 10:23-25. It conveys a pattern that God approved of, was pleased with, and blessed. It was and still is healthy for the church to gather together in these ways. It conveys flexibility and the ability to be relevant to particular contexts. Thus, we see this over the various stages within church history and in various places that the church, even under massive persecution, met in homes, as well as, in larger group gatherings, even in underground catacombs. It is a healthy cycle of gathering on a consistent basis that has Biblical precedent based upon precepts and principles. Thus, we can read about the “patterns” of God’s people and even see the consistent pattern of God’s “patterns” of response and reactions to His people. This helps us understand the “ways of God” and not just commands and principles in a vacuum. Understanding God’s Word, the Bible, in this way (precepts, principles, and patterns) and realizing that all of God’s Word is conveyed in this way helps us understand what God is teaching us in the various passages and books of the Bible.